On World Environment day, the Ministry of Urban Development (MoUD) flagged off its countrywide campaign to segregate waste at source. 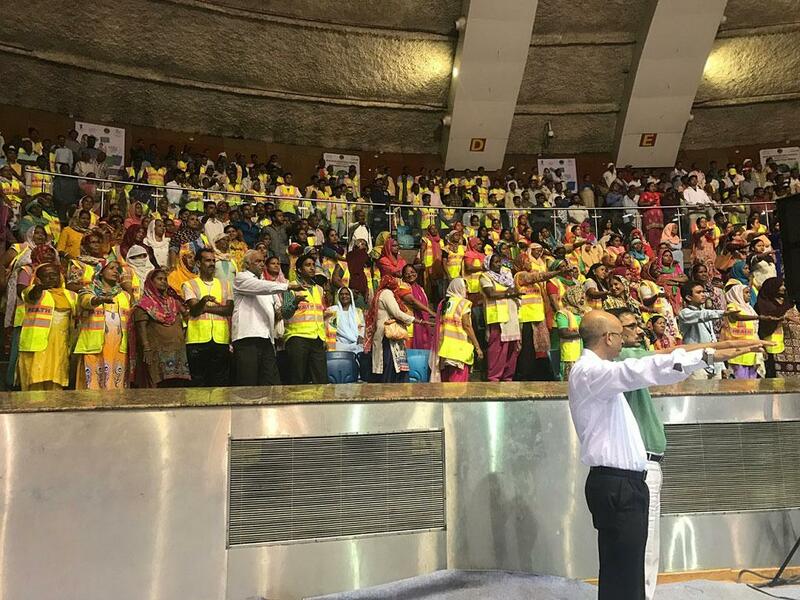 In a public event organised by all the municipal corporations/municipalities of Delhi-NCR, the Urban Development Minister, M Venkaiah Naidu asked every citizen to take a pledge for source segregation. “The sanitation of the cities is not only the responsibility of the municipality but individuals as well,” said the minister. Last month, the MoUD had come out with the results of Swachh Survekshan survey, in which 434 cities were ranked on their status of cleanliness and sanitation. The results were heavily criticised for promoting environmentally unsustainable practices for waste management. According to the analysis by the Centre for Science and Environment, over 90 per cent of the cities in the top 50 do not segregate at source. Moreover, they follow a centralised waste management approach which heavily depends on waste treatment away from the source. 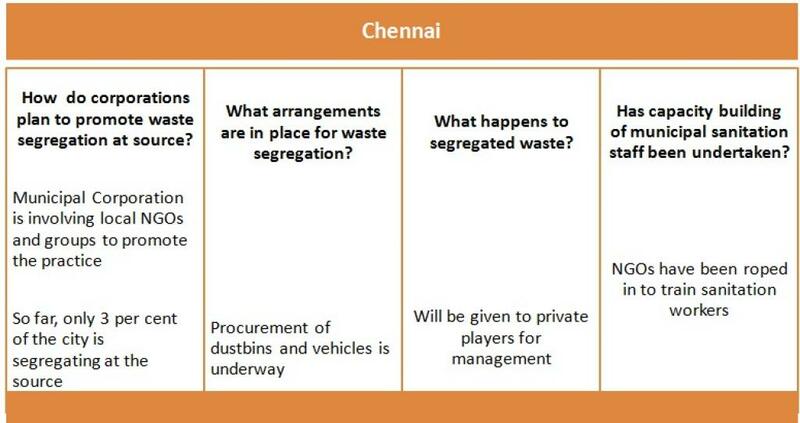 The MoUD, in its directives published in April 2017 on segregation at source, stated that it is going to help at least two cities in each state to become model cities in terms of waste management and would help urban local bodies (ULBs) to help in procurement of materials. 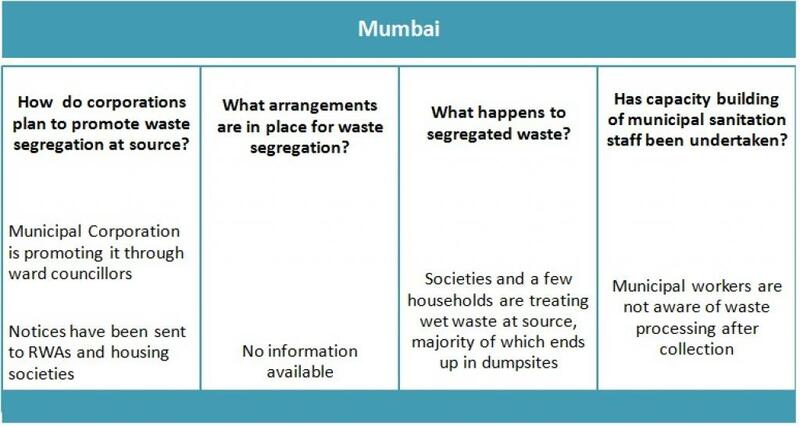 CSE spoke to concerned authorities in few cities that are planning a major waste segregation drive and tried to understand what systems these cities have in place to ensure treatment of segregated waste. It clearly comes out that cities are clueless where the segregated garbage will go. An official from New Delhi Municipal Council (NDMC) stated that it is sustainable to give segregated garbage to waste-to -energy plants (WTEs) in the city as they generate electricity. 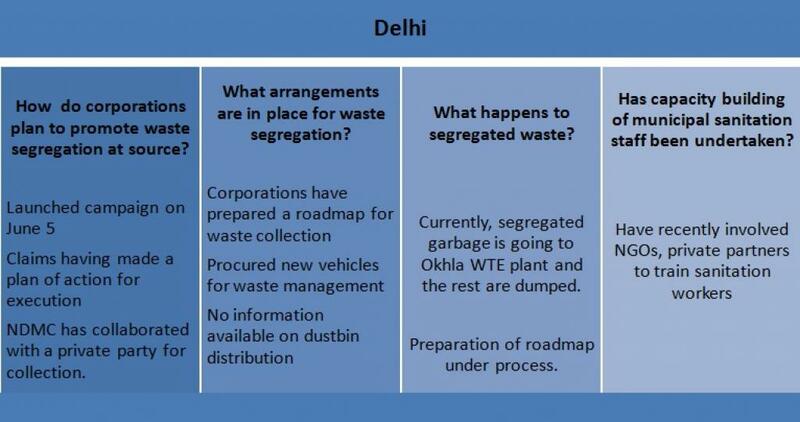 For most of the NDMC, segregated garbage from colonies ends up in Okhla WTE where it is being incinerated. “This is not waste management. Delhi has ample land, vacant spaces and public parks where composting at source can be done. We are not utilising it,” says Ruchika Sethi who has been instrumental in making Gurugram adopt a decentralised waste management plan. “Also, pushing for waste-to-energy and landfilling is in contradiction to the Solid Waste Management Rules, 2016 that clearly state that the focus should be on treatment at source and waste-to-energy and landfill be the least preferred options,” adds Sethi. In Mumbai, segregation is happening in societies and colonies due to individual or community initiatives. However, the corporation is still clueless on how to handle the segregated garbage. An official of the Brihanmumbai Municipal says, “We are only responsible for transportation and have no information on what has to be done with the segregated waste.” “There is dearth of adequate infrastructure to treat segregate waste in the city. We propagate 'compost banao compost apnao’ (do compositng, adopt composting) but sanitation officers/workers are clueless on how composting is done,” he further adds. Panaji had adopted a five-point segregation model but the corporation is struggling to maintain it. “We are facing dearth of sustainable infrastructure and municipalities spend majority of the cost on procurement of vehicles for strengthening collection and transportation,” says Sachin Ambe, City Corporation of Panaji. The need is to invest in management, on how a model will work and this will vary from city to city. ‘Panjim’s five-point segregation model is perfect for us. Similarly, other cities might need different models, but incineration clearly would not help, our garbage does not meet the calorific value requirements for incineration. It has been long debated over,” Ambe further adds. “A country-wide segregation campaign also needs to be backed up by a plan for treatment and processing, only then the segregation at source campaign will be effective,” says Shibu Nair of Thanal, Kerala. “The thing is, once you segregate, there would be nothing left to burn,” adds Nair. 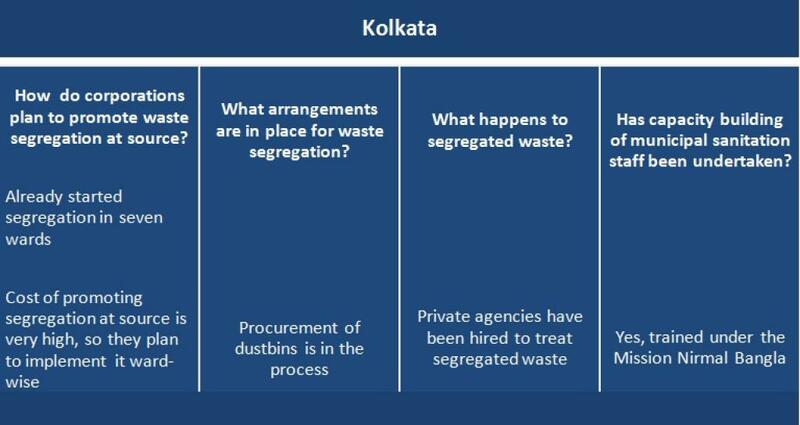 Segregation is the key for efficient waste management and it is not rocket science at all. Delhi, still, dumps a whopping 6,000 metric tonnes of garbage per day in its dumpsites. Most of the valuable, recyclable garbage ends up in these dumpsites, which render them useless. We need to segregate to protect the dignity and health of sanitation workers who are mere scavengers on such dumpsites. We need to segregate for us and not for someone else. So, how can you do your bit towards segregation and contributing to clean and green surrounding? 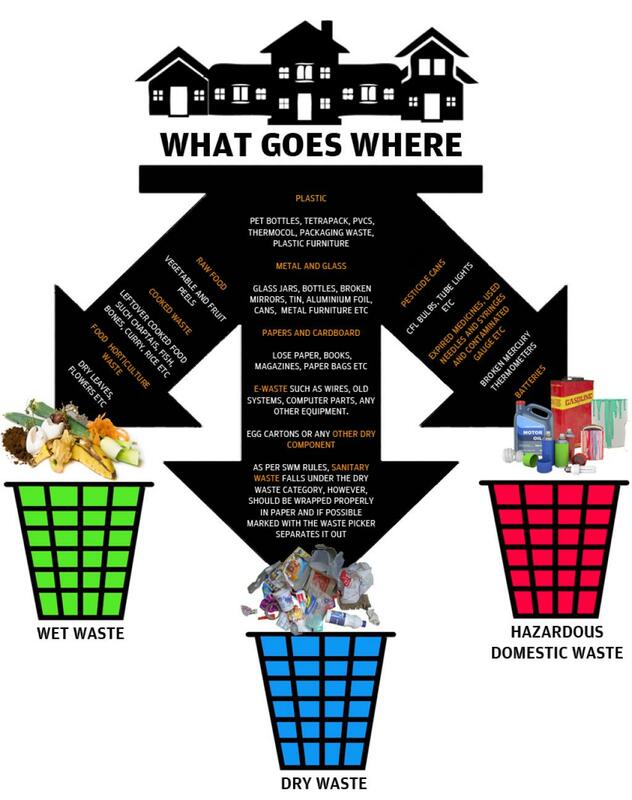 Segregate at source: Keep separate bins for different streams of waste and follow the colour code: keep green for wet waste (cooked and uncooked), blue for dry waste and red for domestic hazardous waste. Compost: Once your kitchen waste is separate, you can use it for composting. About 50-70 per cent of Indian household waste generated is organic in nature and can be used to make compost. A family of four in a city produces anything from 750 gram to 1.5 kg of kitchen waste daily. Recycle: The recyclable material like paper, plastic and PVC, thermocol, glass, metal, cardboard, and E-waste to be stored in other bin. It can be sold to scrap dealers. 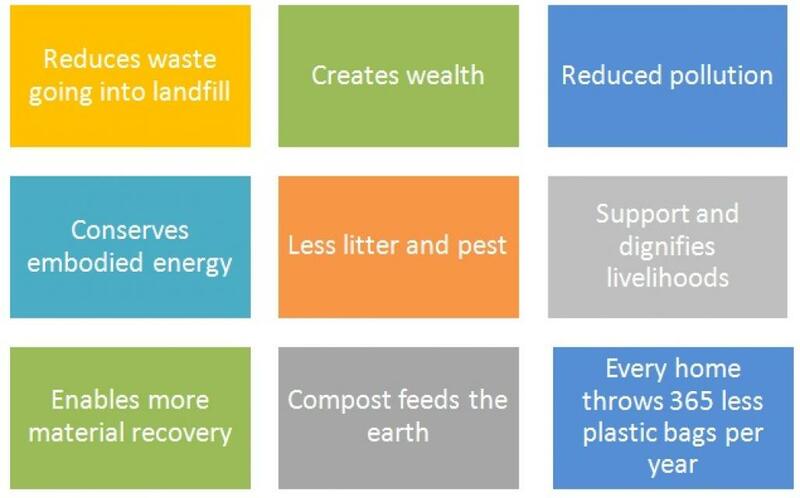 Why segregate waste at source? It is time that we as citizens realise that the segregation at source would only help solve the waste management problem more efficiently. It is easy and can become a habit in no time! Meanwhile, municipalities and authorities should make effective systems for the collection and treatment of the segregated waste. Adults & students both should be educate seriously by way of short film etc.